NobelPearl is a unique alternative to titanium. 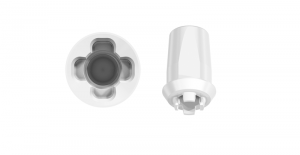 A one-hundred percent metal-free, two-piece ceramic implant solution with a cement-free internal connection, it has been designed to support natural soft-tissue appearance. Its white zirconia material is especially beneficial in patients with a thin mucosal biotype.1Microcirculatory dynamics in peri-implant mucosa around zirconia have been shown to be comparable to those around natural teeth,2 and zirconia has also demonstrated low plaque affinity.3 4 5 In essence, NobelPearl can help patients gain the natural esthetic excellence they desire. Clinicians seeking a ceramic solution for their patients might see cement as the only possibility for restoration placement. While intraoral cementation can be a viable option, the use of excess cement is known to be associated with soft-tissue inflammation and the development of peri-implant mucositis and peri-implantitis.6 To avoid this risk through screw retention, yet remain one-hundred percent metal free, NobelPearl features the innovative VICARBO® screw made of carbon-fiber reinforced polymer. In addition, NobelPearl offers greater restorative flexibility compared with one-piece or cemented ceramic implants, thanks to the two-piece, reversible, cement-free internal connection design. The thread design and tapered implant shape, combined with the tapered drill protocol, have been engineered to achieve high primary stability, and the hydrophilic sand-blasted and acid-etched ZERAFIL™ surface, combined with a partially machined collar, is proven to osseointegrate.8 9 At manufacture, implants and abutments are both milled from hot isostatic-pressed (HIP) zirconium dioxide ATZ blanks – which are proven to be strong – and, at the final shaping of the implant, no sintering or finishing takes place. This enables a high level of dimensional precision and accuracy. The continuous development of ceramic implants by Nobel Biocare’s manufacturing partner has seen an increase in survival rate at every step.10 Now, NobelPearl is a new treatment option that follows a range of well-established workflows for two-piece implants and will be integrated into Nobel Biocare’s digital workflow. Clinicians seeking a successful start in ceramic implantology and to expand their choice for patients can gain peace-of-mind with an easy-to-adopt solution.